NS-40501E Features: -Magnetic resistance with 8 preset levels that adjusts to target workout zone. -Easy-to-read LCD computer screen displays time, speed, distance, calories, odometer and scan-through. -Vinyl covered foam handles provide ergonomic grip for comfortable workout. -Oversized pedals keep feet properly secured as work through stride and makes exercise experience safer and more comfortable. -Large flywheel reduces hops throughout stride motion of pedals and simulates more natural running motion. -Small footprint design allows to place into even most space restrictive rooms. Finish: -Gray. Dimensions: Overall Height - Top to Bottom: -64.2". Overall Width - Side to Side: -23.6". Overall Depth - Front to Back: -48.8". Overall Product Weight: -72.6 lbs. TARGET DIFFERENT MUSCLES - The magnetic resistance bike has eight preset levels that let you control the workout intensity for different muscle groups. CONVENIENT LCD MONITOR - Read your time, speed, distance, and calories, and scan through with ease thanks to the vibrant, well-lit LCD computer screen. SECURED PEDALS - The Marcy Pro's oversized pedals can safely secure feet of every size. Work out more safely and comfortably with this exercise bicycle! 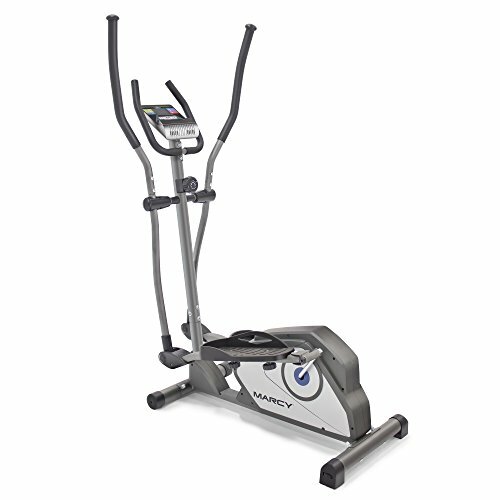 SMALL FOOTPRINT - Save space and money with this 37.8″ × 18.5″ × 13″ elliptical trainer. It will fit in even the most space-restrictive rooms. EASY STORAGE - Move and store your elliptical trainer with ease using the transport wheels.